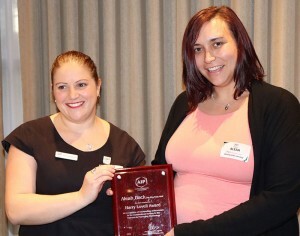 PKN Packaging News Reports: At an AIP NSW meeting in Sydney yesterday, Aleah Back was awarded the prestigious Harry Lovell award for academic excellence. At an AIP NSW meeting in Sydney yesterday, Aleah Back was awarded the prestigious Harry Lovell award for academic excellence. In 2014, Aleah Back, a qualified packaging technologist who is currently employed as Quality Specialist – Fresh – In-Store Bakery at Woolworths Limited, was awarded the APPMA Annual Scholarship to undertake the Diploma in Packaging Technology. In 2016 she graduated achieving her Diploma in record time and excelled in her final exam results. Subsequently, the AIP Education Committee has decided to formally acknowledge her outstanding achievements as a student of the Diploma in Packaging Technology by awarding Aleah the Harry Lovell Award. The Harry Lovell Award recognises outstanding achievement in the examinations leading to the Diploma in Packaging Technology and has not been awarded since 2013.